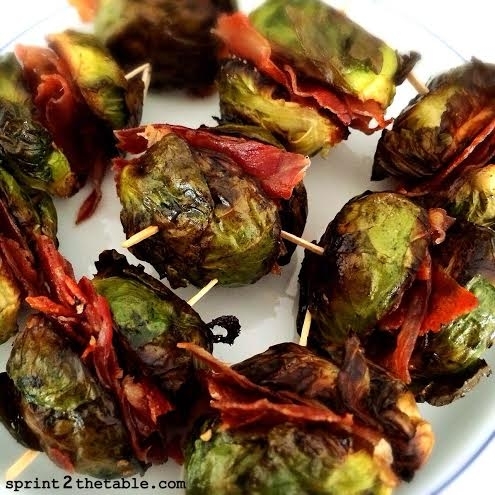 The crispy, slightly sweet brussels are fabulous against the salty prosciutto. Besides, who doesnâ€™t love food on a stick?! Trim just the smallest edge of the ends of your sprouts â€“ donâ€™t trim much because you want them to hold together. Slice the Brussels sprouts in half, lengthwise. Toss the sprouts on a parchment (or foil) lined baking sheet with the oil and pepper. Bake for 30 minutes total, tossing them half way through. While they roast, chop up the prosciutto into small bits. Heat a skillet over medium-high heat. Saute the prosciutto until crispy (~5 mins). Set aside. Remove the sprouts from the oven and let them cool enough to touch. Slide on a sprout half, skewer it onto a toothpick, add a couple of slices of prosciutto, then end it with the other sprout half. Repeat until you have the desired amount of skewers. *Note: You can make these in advance and re-heat them under the broiler for a couple of minutes (until warmed through) before serving.